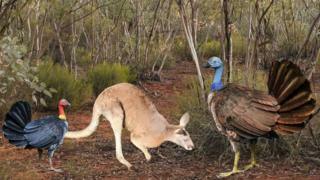 It has been described as a "giant flying turkey" the size of a grey kangaroo by Australian scientists. It is actually an extinct species of megapode bird - an ancient cousin of the modern Malleefowl, which famously builds mounds of earth and leaf litter in which to lay and incubate its eggs. Progura gallinacea probably didn’t do that, however. It lacked the Malleefowl’s large feet and specialised claws, the researchers tell a Royal Society journal. Instead, it’s quite likely P. gallinacea simply buried its eggs in warm sand or soil, just as some living megapodes in Indonesia and the Pacific still do. A team from Flinders University in Adelaide assessed new and old fossil finds in producing its report. Some of the older specimens were first collected in the late 1800s; the newer ones came from the remarkable Thylacoleo caverns of Western Australia, where countless ancient animals fell to their deaths through limestone pipes. The scientists actually describe five new species of extinct megapodes, of which Progura gallinacea was the biggest. These birds all lived in the Pleistocene - a time period that covers 11,700 years ago to 2.5 million years ago. That means they would have existed alongside some of the iconic megafauna - such as the giant marsupials - that disappeared shortly after modern humans first entered the Australian continent. Although many large extinct birds, such as dodos, were flightless, the Flinders team says Progura gallinacea definitely could take to the air. It had strong wing bones and probably roosted in trees, the researchers say. Their paper on the ancient megapodes is published in Open Science.